Samsung Galaxy S3 owners under T-Mobile network are still wondering when to receive the much anticipated Android 4.3 Jelly Bean update. Early last week, a leaked document containing a list of devices to receive an update was posted online. While T-Mobile is among the carriers listed to be allegedly "planning" to release an update soon, there is no confirmation from the company yet. On its support community, T-Force Specialist Maria said they don't have any details on the 4.3 update as of October 31st. 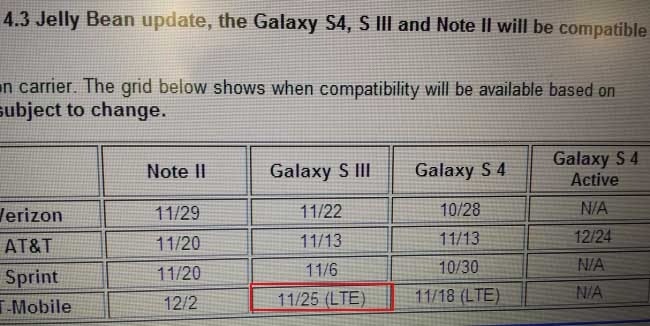 The leaked document showed T-Mobile Galaxy S3 LTE (t999L) would be updated to Android 4.3 on November 25th, which is good news for the owners. However, it left the owners of the non-LTE Galaxy S3 (t999) hanging, and worried as well, because there is no information (even a slight hint) available for them as of the moment. As of now, T-Mobile's LTE variant of Galaxy S3 runs Android 4.1.2 Jelly Bean with baseband version of T999LUVAMB7 while the non-LTE with T999UVDMD5.